Welding is difficult, dirty and at times dangerous work. It’s also an exciting and profitable career. Al Azadwinder Singh Sumal should know, he’s been welding for more than 45 years and educating generation after generation of welders at Kwantlen Polytechnic University (KPU) for the last three decades. Of himself and his students, Sumal accepts nothing less than excellence. And the welding industry knows it. Sumal was named the 2018 Howard E. Adkins Memorial Instructor Membership Award recipient by the American Welding Society, which recognizes outstanding teaching accomplishments from across North America. He is the first B.C. recipient to receive the award. Sumal is the chair of the the welding and metal fabrication department in KPU's Faculty of Trades and Technology. 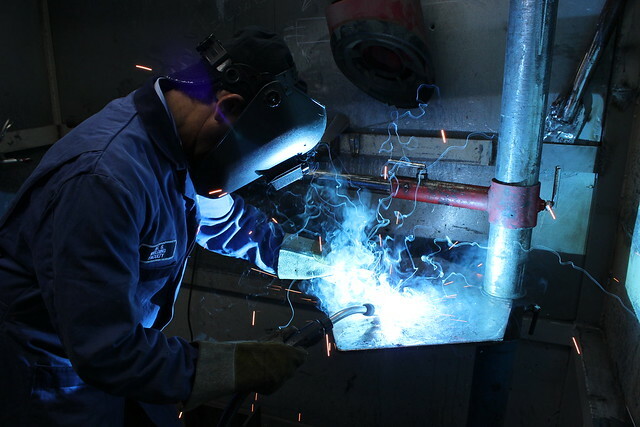 He leads instructors in teaching new welders, apprentices and qualified welders who are upgrading their skills, as well as directly instructing students himself. Beyond the curriculum, Sumal also creates programs that assist underrepresented groups to explore possible welding careers. This includes not only attending and promoting welding at skilled trades forums and high school events, but also developing programs for women, First Nations and the welding industry. Last year, he met a group of refugees interviewed each one to determine their welding skills and put together individual learning plans. Sumal is also working with a non-profit organization in India setting up a welder and metal fabrication training program for underprivileged youth. Engaged in provincial, national and international program and accreditation development, Sumal is currently a provincial and national curriculum committee member which comprises representatives from post-secondary institutes that train welders in B.C and across Canada. He developed and qualified numerous welding procedures for both Technical Safety BC and the private sector. He implemented and manages B.C.’s largest welder training and testing centre. An engineering colleague of Sumal’s for the past 30 years wrote in a letter of support to the American Welding Society that what makes Sumal an exceptional welding educator is that he “always put his students first and he loves teaching. His joy is seeing his student excel in their chosen welding work." Sumal’s welding career began in England in 1973. He took an apprenticeship program at the City and Guild of London Institute in Welding Craft and Technology before coming to Canada in 1977 where he immediately found work in the B.C. welding sector. Sumal has lived in the Surrey neighbourhood of Royal Heights since 1980, which was “just around the corner” from KPU (then part of Douglas College) where he obtained his Canadian certification. He joined KPU’s faculty in 1982 as a part-time welding instructor and in 1986 became a full-time member of faculty. The Howard E. Adkins Memorial Instructor Membership Award will be presented to Sumal by the American Welding Society at an industry expo in Atlanta, Georgia in November. For more information on KPU’s welding program, please visit kpu.ca/trades/welding.